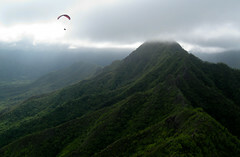 Seven pilots flew Kahana today: Scot, Pete and Joey came out (after having already flown a strong morning session with RT out at Makapuu), as well as Alan, BC Steph and Austria Tim. After reaching the ridiculously low cloud ceiling at 1,500 feet, Scot led an improbable charge across the bay under his new superwing, and after an eternity struggling in light north conditions to get high enough to follow, I finally made it over just as he was coming back. In addition to the super low clouds, the wind conditions were strange: there was a brisk flow across upper launch (on the regular ridge) but very little lift there. The sensor reported an easterly flow, and the cloud drift was easterly, but the air at the surface seemed decidedly northerly to us, and after quite a while the sensor and the cloud drift finally started to confirm the northerly direction we were feeling. We did our best to stay under the radar by landing (or walking over after landing), folding our gear and sipping refreshments at the BOAT RAMP end of the beach. Thanks to everyone for their gracious cooperation. There's a nice huge grassy area there and picnic tables too. PLEASE, do not park or fold your gear in the usual CAMPING SECTION of the park, so as not to distract from (or take stray salvos from) the embattled parties over there. They all have our deepest sympathy, but let's keep our flying under the radar until the situation is resolved, thanks.